I did an activity today in class that I felt I should share with my fellow educators. 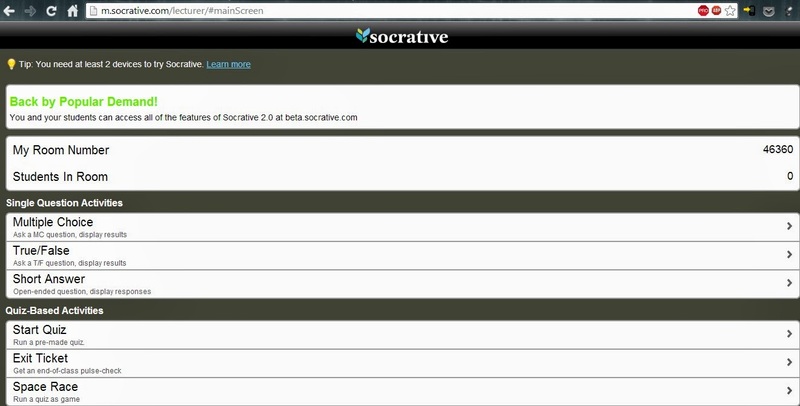 It involved using Socrative to assess a series of student created videos on Sexually Transmitted Infections (S.T.Is)... I know fun right!? In my last post I spoke about the web based tool Socrative and its usefulness in regards to gathering feedback from students to improve the content and skills we as teachers deliver. So now it's time to flip the idea on it's head and talk about how this tool can be used to provide feedback to students regarding their own progress. In previous lessons my year 9 class had been exploring STIs and sexual health, this led into their main assessment piece which was for them to develop a video/cartoon/podcast that focused on one STI of their choice. They needed to cover signs & symptoms, treatment, prevention and how it could impact on their lifestyle. They also needed to introduce interesting facts or statistics regarding their chosen STI. Students were told that their finished product would be shown to the class with their mark coming from both their teacher and their fellow classmates. How engaging is this presentation? Have you learnt anything new? Does this presentation cover signs and symptoms? Does this presentation highlight how the STI is treated? Overall what did you think of this presentation? Each question was multiple choice (except the first two) and students quickly filled out the quiz at the end of each video. At the same time as they filled their quizzes out my colleagues and I would tick our own marking criteria sheet and them compare our answers. I gathered all the marking data from my colleagues and was sure to email myself a copy of the students responses to each quiz. The student results came through as separate Excel documents so I placed the data into an easy to read grid (google document located here)that also turned the results anonymous. Students will receive both sets of mark sheets back in their next lesson. What we found most valuable and interesting from the whole experience was that everyone was engaged in the process of reviewing and that everyone felt they had a chance to comment on what they thought was good practice and what was in need of improvement. Instant cross marking and discovering that we had similar "marks" for each group presentation that we assessed as teachers. 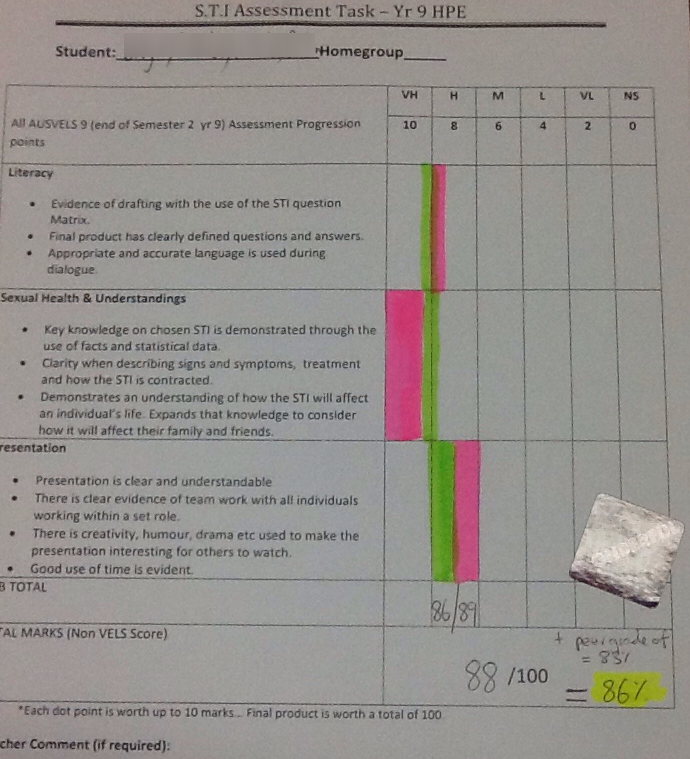 That students were honest in the process and marked their peers to a similar grade to what their teachers had done. I'm doing this again tomorrow with my other year 9 class, can't wait to see if the results fall similar again! 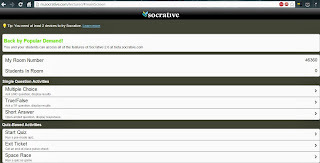 Socrative is a free web based application that has become very popular in education in the last couple of years. The best thing about it is that only the teacher needs to sign up for an account and students only need to know their teacher’s room number. You can create quizzes that are either teacher paced or student paced. The quizzes can be Multiple choice, T/F or Short Answer in nature. You can also create Exit Tickets which are the main focus of this blog post. So differentiation is involved how? Exit Tickets gauge exactly where your students are at by the end of a lesson with a quick series of questions for students to answer. This information is compiled in a excel file for you to skim over at the end of a lesson or series of lessons. This will allow you to alter lesson ideas to suit students and their learning needs. So just what is an “Exit Ticket?” you ask? Well in it’s simplest form it is a short survey filled out at the end of a lesson. They are becoming common practice at the end of most sessions at any PD conference to allow presenters and hosts to gauge how successful the sessions run were. Questions are usually in a poll or short answer form and are designed to be completed quickly by participants leaving your lesson. 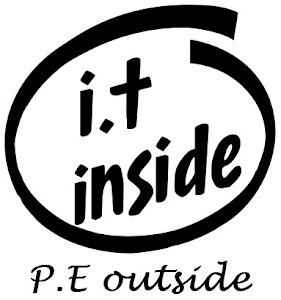 So let’s have a look at how it all works. You will need to create/sign up for a Teacher’s Account, and then it’s all systems go! Students will need access to the internet and either the website http://socrative.com/ or they can have the Student version of the app (available free on both apple and android devices). I have both apps on all my devices in case I ever need to be a “student” as well. Click to enlarge - Exit Ticket is 2nd from the bottom of image. The student log in is really basic, they only need your room number which is always visible on your summary page. I place my number (which never changes) on the board and ask the students to record this down in their diary or in a note on their device for future reference. When they fill out the last question they have an option to just Finish the Exit Ticket or to Finish and then allow someone else to fill it in out after them. The flexibility of this meant that I could use this in a class with a limited number of devices or a class where everyone had a device. The results are compiled and you have the option of downloading the report or emailing the report to yourself for later viewing. If you are using the mobile app you only have the option to email to yourself. How would you like this data you have just collected? The information is sent to you in an excel document with each question/answer in a column and each student/responder in a row, you can simply scroll across to see how a student went individually or scroll down to see an overall result for a certain question. This works well in both theory and practical classes as the main aim is to assess whether students have felt that they have learnt something or have been challenged in their way of thinking. You might find in the first couple of attempts of doing this that students will be tempted to be silly or even untruthful in their answers especially if reflecting and reviewing their progress isn't a regularly occurring practice for them. Don't be put off though, instead ensure that this practice is a regular event and that it is always consistent. Students will come to develop self reviewing skills as a result and you will soon find that they are quite descriptive in their responses to the answers in their Exit Ticket, thus building on the class practice with you as opposed to waiting for you to just deliver the content and hoping that it is something that will engage and challenge them. The great thing is it also provides feedback to the teacher instantly that may help them determine why a lesson wasn't as successful as they thought it would be when planning it. Give it a go! You could be surprised at the results.